Original photography print by David J. Dachauer. 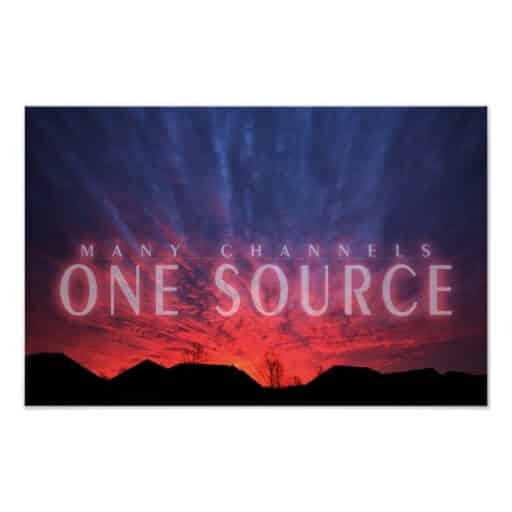 Inspirational wall art: “One Source” features a beautiful Arkansas sunrise with awesome clouds and the inspirational affirmation “Many Channels, One Source”. The affirmation conveys the idea that your blessings can come to you through many different channels such as relationships with others, your employment, the sunshine on your face, etc. but they all have one Source. Some call it God, some call it The All, The Universe, etc. It also serves as a reminder not to confuse a channel with The Source, i.e. your employment is NOT your source of income but rather a channel through which The Source provides.